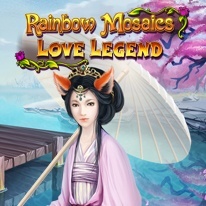 A noble Love Legend mixed with fabulous mosaics puzzles! Kitsune is a supernatural creature called a fox-shapeshifter, possessing profound knowledge, long life and extraordinary powers. Her main power is the ability to take the appearance of a human. Most often, Kitsune turns into a seductive, beautiful girl. But where can the union of a man and a fox lead? Join the the pair of sweethearts - Yoichi and Kitsune - and find out what obstacles get in their way, and eventually get that the the most powerful magic of all is – True Love!